Newswire #55 – 19th Jan 2016. Your weekly roundup and update of Anime Limited related news. Date changes sees a revised Q1 lineup. Details on our Noein: To Your Other Self Blu-ray release, plus a special limited time pre-order offer at our web shop for this. and more. Read on below for details. ~ First of all a quick reminder that our next releases arrive on 8th February with our Limited Edition Blu-ray of Gankutsuou: The Count of Monte Cristo and our Blu-ray release of Mobile Suit Gundam Part 2. Both are available to pre-order from the likes of Amazon, Zavvi and Base now. ~ So let’s cut the chase, a bunch of dates have moved for upcoming releases of ours. We are very sorry for these changes – believe me, it hits us just as hard and we absolutely hate having to announce them. The reason for all this? Pick a project – various falling down moments at different stages in every project have contributed to this. Taking a good hard look at where everything stood after the holidays, we realised that yes, another round of delays. This time though, we’ve decided to leave our optimism behind and be very conservative in our new dates. Pushing for worst case scenario and hoping for the best. Tokyo ESP has shifted to 28th March. 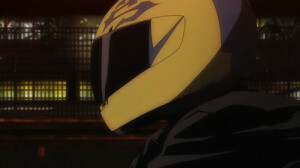 Durarara!! X2 – The First Arc: Shou has been pushed back to 25th April. Letter To Momo has shifted to 11th April. Selector Infected WIXOSS and Lord Marksman and Vanadis have both shifted to 18th April. Expelled From Paradise and Psychic School Wars, both were marked previously as TBC and we can now confirm that these will be getting released on 9th May. Gundam Reconguista in G Part 1, previously we mentioned it was TBC until further notice and today we’re happy to confirm it will be coming on 27th June. Riddle – Story of Devil and Brothers Conflict have both been shifted to 27th June. So yeah, a lot of you are probably wondering: how solid are these dates? What are the next round of delays going to be like? As painful as that is to type, we get it. Which is why we’ve had a very long, very involved meeting about times – instigating super conservative, worst-case-scenario dates and putting them down. It’s the best we can do on this – things happen, delays on approvals happen, delays in changes and problems in production at the various stages of development happen (possible subject of future podcast maybe?) so based on the past couple years’ experience, we’re throwing away our optimism and going with super cautious until we got this down solid. So unless really exceptional circumstances happen (and they do happen! I’ve got horror stories aplenty) we’re doing everything we feasibly can to get dates right from the start. ~ A quick note regarding Kill la Kill Part 1 standard edition, it is indeed scheduled for 28th March as noted above. Last week we mentioned it was scheduled for 16th March. That was a typo on our part, so many apologies for the misinformation on that. You can expect to start seeing it show up with retailer sites within the next few weeks. 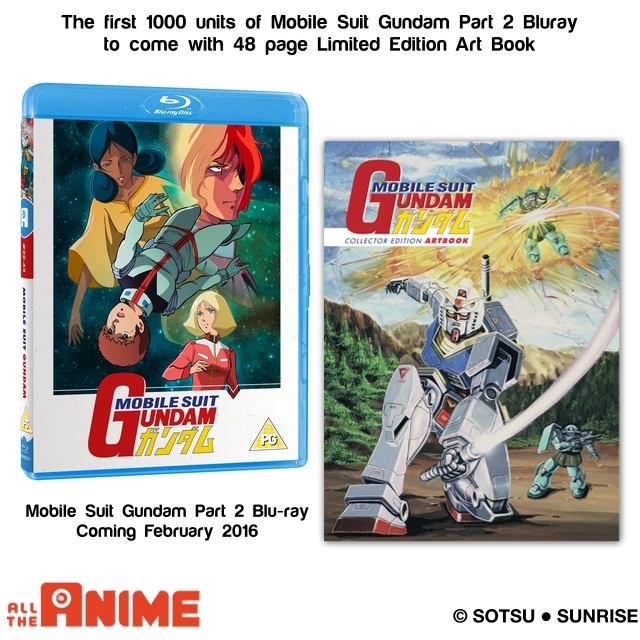 ~ Interested in getting our Mobile Suit Gundam Part 2 Blu-ray release and really want to get the art book? We’ve made a page on our blog specifically for this release with all the details. You can read this HERE. ~ If you’re interested picking up Miss Hokusai following its cinema run with the Japan Foundation Film Touring Programme, be on the lookout for details of special a pre-order offer that will be exclusive to our web shop soon! For those wondering, we’re going to have details on what you can expect with our release in general soon. Now although we’re near enough set when it comes to approvals on this title, it does still take some time to produce the actual product. So until we have a firm confirmation on a few things, we’re holding off on announcing a new release date. But with the way things are looking it’ll more than likely by in Q1, hence why above I said there might be an addition or two to that lineup. 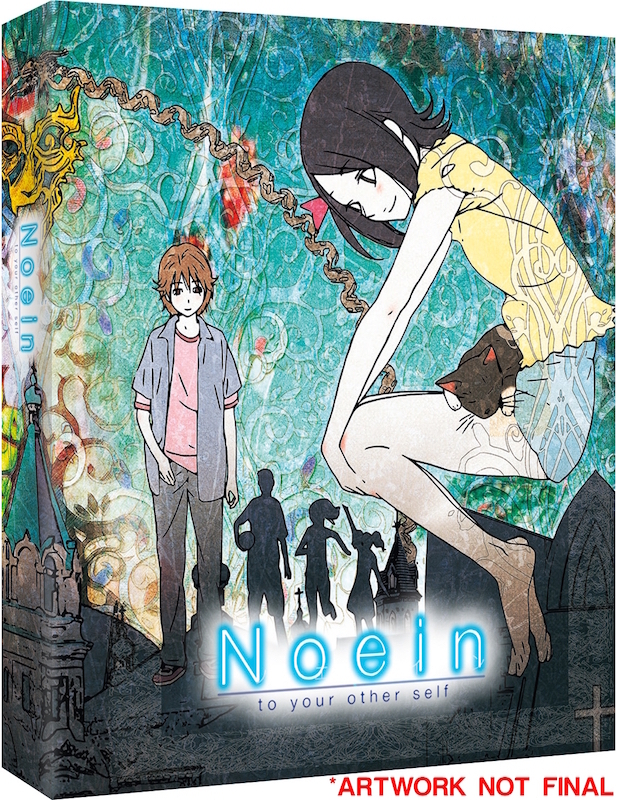 SPECIAL OFFER: As of now you can pre-order Noein: To Your Other Self Limited Collector’s Edition Blu-ray at our web shop HERE. Until midday this Monday (25th January) we are having an early-bird special pre-order offer where you can pre-order it for only £29.99. After midday on Monday the price will go up to our regular listing price. ~ For those of you like our podcast, we’ll be having a new one for you later this week! Admittedly I (Jeremy) have been bogged down with work and such so I’m still in the process of editing it. Nearly there though so should be up in the next day or two. We might also be recording another bit to add to it in light of the above information. ~ We also want to take a moment to make it known that we’ve got some exciting news to share with you later this week! This will be in relation to titles we haven’t announced yet and releases planned for Q2 this year! So keep your eyes peeled to our channels for details. ~ The Case of Hana & Alice is getting a cinema screening in London as part of the Asia House Film Festival. You can catch the film on 27th February at the Regent Street Cinema near Oxford Circus. You can book tickets today HERE. For those of you outside of London there’ll be some news on other screenings coming soon. Please stay tuned for details. ~ Speaking of cinema screenings a quick reminder that both Miss Hokusai and The Anthem of the Heart are part of the Japan Foundation Film UK touring programme. You can get the details on where they’re being screened HERE. ~ Staying on the subject of cinemas, did you hear that Studio Ghibli’s When Marnie Was There has been nominated for an Oscar? Be sure to have a read of the piece by Andrew Osmond who explores the films that are, and aren’t, at the Oscars this years at out blog. You can read it HERE. ~ For those of you looking forward to our release of Tokyo Ghou √A, pronounced Root A for those that don’t know, aka Season 2, we’re hoping to have some details to share with you soon. At this stage we can say it’s planned for release around May/June time. But we can also confirm that we are planning a Limited Edition Blu-ray set that will follow in the similar style to our out-of-print season 1 Limited Edition Blu-ray. Stay tuned for more updates on this soon. ~ Our Tokyo ESP release in March will include both the English dub produced buy Funimation and the original Japanese language audio with subtitles. With that in mind Funimation have revealed the cast for the English dub and it included some new voice talents. You can read more about this HERE. ~ Some of you have been wondering when a home video release of Seraph of the End might be coming. Just to put this our there we only ever had the simulcast rights to the series, meaning we will not be bringing this to Blu-ray/DVD. However it is our friends at NBC Universal who will be bringing it to the UK. We have nothing to do with their release, but for those of you interested listings for their release appeared on Amazon UK HERE and Zavvi HERE over the weekend. Again, we have nothing to do with this release so any queries about this we suggest directing to them the distributor in question. This replacement scheme closes on Thursday 31st March 2016. The latest round of confirmation messages were sent on 15th January. The next wave will be getting sent later this week. If you have applied for discs since then your application will be processed soon. We appreciate people’s patience with this. If you’ve yet to apply for discs please follow the steps of filling out the survey AND emailing us your proof of purchase. (Simply doing one of the two steps is not enough.) If you haven’t received a confirmation message within to weeks of applying please email Jeremy on Jeremy@AllTheAnime.com – he’ll get back to you as quickly as we can about this. Here you’ll find a list of events we’ll be attending during 2016. The looks small at the moment, but trust us when we say it’ll start looking packed soon. And that concludes this edition of the Newswire. Be sure to keep an eye both here at our blog and on our social media channels for the latest news regarding Anime Limited along with some great reading material too. This is becoming really pathetic. All UK licensors get huge delays on their releases. Is it such a pain to get approval from the USA dubbing companies and from Japan? I feel we as European anime fans always get the short end of the stick out of it. There is never and I mean NEVER an anime that i first saw on DVD before I downloaded it. Yea I’m against downloading but this delays are becoming ridiculous really. Also I do not understand really why it gets delayed so much. Dont the Amercian dub companies and the companies in Japan wanna get money from the DVD sales here? Really I dont understand the hold up. This way I remain downloading or watching it on illegal streaming websites till i can add the DVD/blu-ray to my collection. Is there not anything you guys can do about it? Or is the communication with Japan this horrible? Anime Limited are actually much better when it comes to releases than MVM. MVM seem to love giving a release date and delaying that show a certain number of times. Anime Limited seem to be more, delaying a few weeks rather than many months like MVM lol. Anyway you can’t really blame delays on you watching something illegally online instead. We all know how long it takes between a release in Japan, and a release in the UK. But I do agree with the sentiment of your post, the delays we’ve seen so far for anime in the UK are absolutely ridiculous.